Bessie 2's Story . . .
There’s no slowing Miss Bessie’s progress these days! With recovery from a complicated surgery behind her and many pounds gained, her vet determined her to be in good health and ready for spaying. That went smoothly, bringing Bessie to a mini-milestone; she’s ready now for a forever home. “They don’t come any sweeter………”, this from the foster family who knows her best. Complete this gal’s new beginning by welcoming her into your life. The kisses, companionship and love she brings will warm your heart, well beyond the holidays! Picked up as a stray in Virginia, Bessie was underweight, dirty, and suffering with a large tumor hanging from her belly. When the shelter found her to be a very sweet, loving girl, they turned to MAESSR for help in dealing with Bessie’s issues. MAESSR came to the rescue and Bessie was moved to a veterinary facility to have the tumor removed and to be spayed. Unfortunately, the surgery to remove the tumor was more difficult than anticipated, so her spaying had to wait. Her recovery was not easy and she had a relapse with bleeding and more surgery. Poor Bessie ended up staying at the veterinary facility for a few more weeks until she was strong enough to be transported to her foster home. Throughout it all Bessie remained loving and appreciative of all the help that was bestowed upon her. Bessie had a rough couple of days upon her arrival in foster care; she was running a fever and was very lethargic. Her foster mom lovingly worked very hard during that time, sitting in the floor with this sweet girl, feeding her little bits of food every few hours, and letting her know she was in safe hands at last. 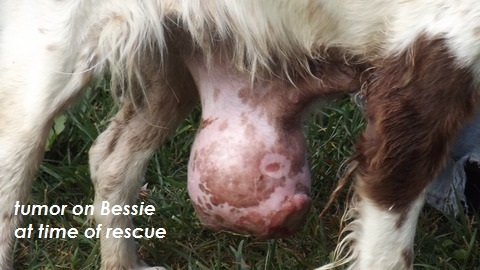 Bessie started to eat, and with meds to help with her issues, she did a complete turnaround. Within a few days she was eating well, checking out the yard, and interacting with the other dogs in the home. A recent visit to the vet resulted in the good news that she had gained 8 pounds in foster care and is recovered enough that she can be spayed very soon. Although she didn’t act like she was used to living in a house, Bessie has not had any accidents and appears to be housetrained. She even started using the doggie door on Day 4 and is now coming and going as she sees fit. Bessie has been crated, but since she has such good manners, she is allowed the run of the house while her foster mom is not home. During her second week in her foster home, she began to investigate the trash can and counters, but quickly understood that was not the right thing to do. The coffee table is another story, much too tempting and easily assessable, so her foster mom is being trained not to set food down unattended. Bessie walks well on the leash, loves to ride in the car, and is very well behaved in the house. At night she sleeps on a doggie bed in her foster mom’s room. Bessie so far has shown no interest in toys; she will however pick up paper or wrappers if she finds them on the floor and carry them around. This is one sweet little girl, a true Velcro springer, and a devoted companion. Watch for news to come! She will be ready for adoption soon and you don’t want to miss this one. She gives great kisses!